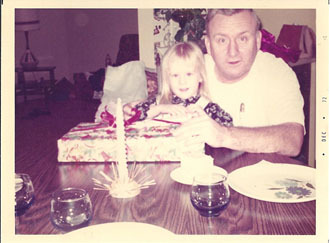 Leah Marie Brown, at four years old, asking Santa for an electric typewriter and a slingshot. Grace Murphy was a latchkey kid. The protagonist of Finding Colin was the only child of a single, working mother, which means she grew up spending a lot of time alone and learning how to fend for herself. Now, grown-up and truly on her own, Grace dreads the Holidays. I was also a latchkey kid. I grew up in the 1970s as the only child of a single, working mother. I wore second-hand clothes and an itchy piece of yarn with my housekey attached to it around my neck. In other words, I feel Grace’s pain. I was more fortunate than Grace, though. My mother worked her slender fingers to the bones to make my Christmases special, to fill them with traditions and memories I now cherish. She started the first tradition when I was an infant, barely a month old: she took me to visit Santa (which, later, I discovered was a family friend in a rented costume). As I grew, she took me to Lion Store at the Franklin Park Mall in Toledo, Ohio. 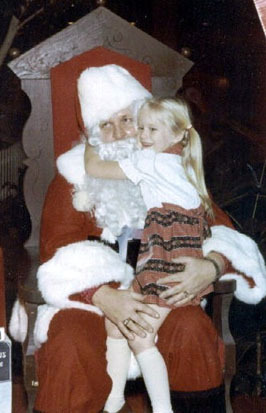 My visit with Santa was always a carefully planned and executed event. First, mom made me write Santa a letter, thanking him for his generosity and politely asking him for my heart’s content (a slingshot topped that list for six years until I finally gave up and asked for an Evel Knievel doll instead). Next, I would put on my best dress and mom would style my hair (once, in massive Princess Leia buns, cringing). 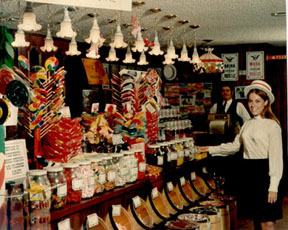 After delivering my carefully worded wish list and squeezing on my main maned man, Mom would treat me to an ice cream sundae at Farrell’s Ice Cream Parlor, an old-time ice cream shop with player piano and perky employees in 1900s period dress (straw boaters and suspenders!). Mom made a lot of things an event – like baking Christmas cookies. I have vivid memories of pressing tin cookie cutters into chilled dough and decorating the finished products, wonky angels with neon yellow frosting, fat, jolly Santas dipped in pink icing and finished with two silver dragees for eyes. We would wrap up the best cookies and deliver them to my grandpa, singing Christmas carols at the top of our lungs as she maneuvered the frozen streets in her orange Plymouth Horizon. The rest of the evening would be spent playing Scrabble. I would make it through one round and then fall asleep on the sofa listening to Bing Crosby sing White Christmas and the two people I loved best in the world playfully arguing over words. Visits with Santa. Baking Christmas cookies. Spending time with family. Those are all great memories, but what about the gifts? Even with her limited income, my mom gave fabulous, memorable gifts: My beloved Mrs. Beasley doll that whispered, “Come closer, dear, so Mrs. Beasley can hear you.” One year, she gave me Rudolph the Red Nose Reindeer’s ankle bracelet. True story – or, at least, I thought it was true when I was a gullible seven-year-old. The stretchy bracelet with cat’s eye beads was my most treasured possession – until I lost it on the playground. When you’re poor, your imagination will take you farther than your savings account, and mom let her imagination soar. The gift I treasure the most, the one I keep wrapped in tissue paper in my jewelry box, is my charm bracelet. My mom must have scrimped and saved to buy me the charm bracelet. Each year she would add a charm reflective of my interests – a telephone (because I talk a lot), an angel (because I played one in a school play), Mickey Mouse (to commemorate our only vacation – to visit friends in Florida), a bowling pin and ball (it baffles me to this day, but I joined a bowling league in elementary school – don’t judge! ), a cheerleader’s megaphone (I quickly dropped bowling for cheerleading). Through her many sacrifices, my mom taught me it’s not what’s under the tree that matters, it’s who is sitting beside you, munching on wonky sugar cookie angels and watching the lights twinkle like stars in a midnight sky. Leah Marie Brown with her Gramps, opening a Christmas gift (that most certainly is NOT a sling shot). 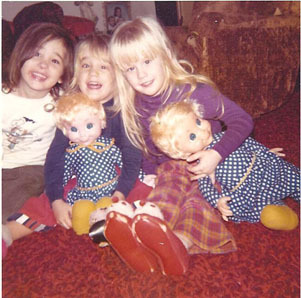 Leah Marie Brown and cousins with their Mrs. Beasley dolls. 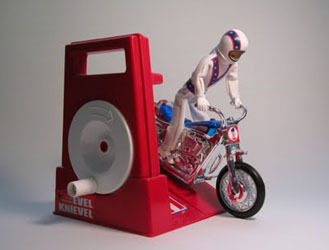 The much coveted and never received Evel Knievel stunt figurine and motorcycle, with wind-up, revving action! 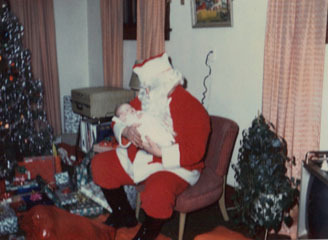 Leah Marie Brown, one-month, visiting Santa for the first time and probably asking him for a dry diaper. This winter, let four tales of mistletoe magic and the spirit of the season cast a special glow as some of your favorite authors introduce stories of hope, happiness, and holiday hearts. Starting over in a new town with a new job, Meredith thinks buying Noah’s grandmother’s house will be a simple business deal. But neighborly Noah is determined to make Meredith feel at home—and as the holiday season works its magic, he’s suddenly hoping that she’ll find a place for him in her heart. A blind date turns out to be anything but when Ruby finds Knox on her doorstep. A few years ago, she nursed his dying wife. Can two lonely people defeat the shadow of the past and let the spirit of Christmas offer them the most special gift of all? When Grace is suspended from work over the Christmas holidays, she does the only sensible thing—she travels to Ireland to find her favorite actor! But while the Colin she finds may not be a star, he’s ready to show her that gifts come in all shapes and sizes—and love is the miracle that truly counts.